This map of Marion and Washington Counties, KY is especially helpful for locating watercourses. Buried in microfilm cabinets in Kentucky’s research libraries are rolls of microfilm simply labeled “Tax Lists”. Arranged by county in chronological order, tax lists are a hidden treasure for researchers studying Kentucky’s history, culture, and land title. As census information is collected decennially (every 10 years), data derived from the annual collection of taxes provides a better insight into the household of the taxpayer and his/her acquisition of property, both real and personal. Free males 21 years of age or older are enumerated (and named) on tax lists if they own one horse. Women are included on tax lists if they are the head-of-the-household. Free Blacks are named on tax lists decades before the Civil War. The number of livestock and the value of hemp & other agricultural products provide insight into Kentucky’s agrarian society. Thenumber of town lots, wheeled carriages, jewelry, tavern licenses and billiard tables—yes, billiard tables were taxed or the owner faced severe penalties if the tables were not reported—provide insight into Kentucky’s developing society. (It is interesting to note that tax collectors were local residents; would tax payers withhold taxable items to avoid taxation or would they be more likely to report everything so they could be considered “the richest person in the county”?) In later years, the numbers of school age children reported on tax lists are invaluable for researchers tracing the development of Kentucky’s educational system. Now these tax lists are accessible from your home thanks to Family Search. I accessed the tax lists by searching for the county in the FamilySearch.org catalog. Look for the "TAXATION" records then select the original records from the county. Many of the earliest tax lists have been digitized but you my have to order a microfilm. I recommend that you search for old maps that help to locate watercourses. 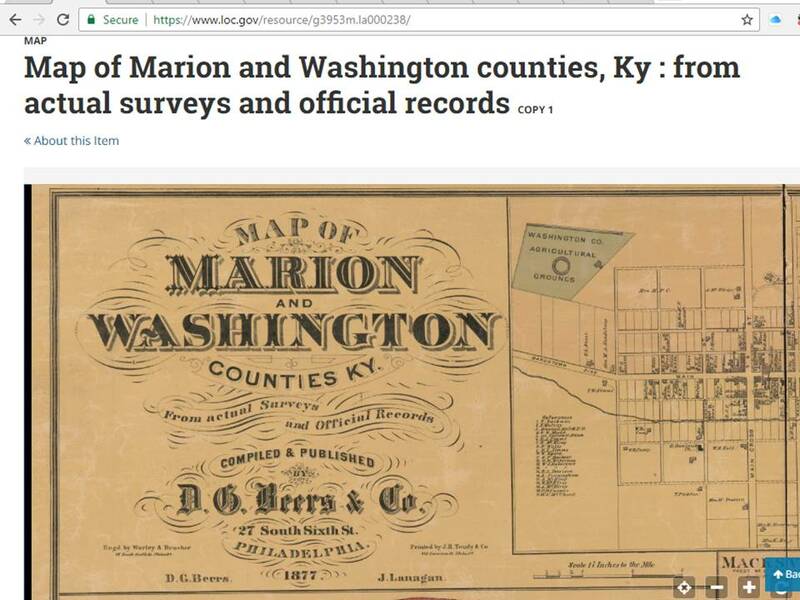 An especially helpful map for researchers in Washington and Marion Counties of Kentucky is located on the Library of Congress website at the following URL: https://www.loc.gov/resource/g3953m.la000238/ I pasted an image from this web document at the beginning of this article. Even if you are not interested in this particular county, you should check the Library of Congress catalog for similar maps. It is really cool how easy it is to zoom in and out of this map. This particular map shows the residences of landowners that subscribed to the publication in 1877. 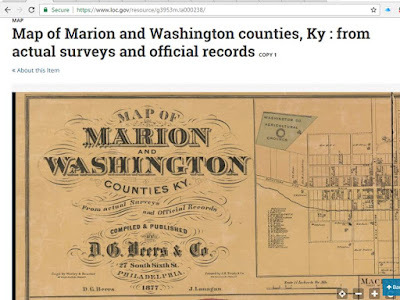 Marion County was created from Washington County in 1834 so some of the land that appears on the Washington County tax lists between 1792-1833 will be found within the Marion County boundaries. Jacob Coffman, 1780-1852 is known to have married Arey Fowler in 1805 in Washington County, Kentucky. The marriage record includes a permission slip from Thomas Fowler, father of Arey. The marriage states that Jacob and Arey are both residents of Washington County, Kentucky. The tax records should help to confirm that Jacob Coffman and Thomas Fowler are residents. I have inserted hyperlinks for the years where Jacob was actually found. LDS Film #7834519 includes early tax lists for Washington County, Kentucky and it has been digitized on FamilySearch.org. 1805- Image 473 of 1188 is the first “C” listing for 1805. Searching through the end of the “C” listings for 1805 on image 477, there is no listing for Jacob Coffman or any other Coffman. 1806- Image 530 of 1188 is the first “C” listing for 1806. It shows Jacob COFFMAN in 1806 not owning any land but in possession of two mare horses. His line on the 1806 tax record showed tick marks for white males above 21 and the horses but there were no marks for white males above 16; Blacks above 16; Steed horses; rates of covering (sp? ); retail stores; tavern license; or value of lots. There is also Abraham COFFMAN on the same page and he does not own any land either. Abraham owns five mare horses. Jacob and Abraham Coffman were the only Coffmans listed in 1806. 1807- Image 581 of 1188 is the first “C” listing for 1807. Searching through the end of the “C” listings for 1807 on image 584, there is no listing for Jacob Coffman or any other Coffman. 1808- Image 624 of 1188 is the first “C” listing for 1808. Searching through the end of the “C” listings for 1808 on image 628, there is no listing for Jacob Coffman or any other Coffman. 1809- Image 677 of 1188 is the first “C” listing for 1809. Image 680 of 1188 shows Jacob Coffman was registered on May 18, 1809 as a white male over 21 with one mare horse. There are no other Coffmans on this tax list. 1809-Archibald Daugherty [sic AKA Archibald Dorothy] is on the first page of the “D” listings on image 682 with two parcels of 116 acres and 60 acres on Chaplins Fork. Archibald Dorothy was a brother-in-law of Jacob Coffman. In 1815 Jacob is a witness to a deed of involving Archibald Dorothy. 1814- Fowler Image 966 William no land, 3 horses; There are two men named Thomas Fowler on this page. The first one had no land and two horses. The second Thomas Fowler was taxed for 97 acres on Rolling Fork original entry by Tho. Arbuckle and 3 horses. Rolling Fork becomes part of Marion County in 1834, county seat, Lebanon. 1816- Coffman- Image 1117 Jacob Coffman owns no land and 2 horses. No other Coffmans listed in this tax year. 1817- Coffman- Image 15 of 1254 Jacob Coffman had 50 acres on Chaplin River entered by Grigsby and surveyed by Calhoun and 1 horse (mare); no other Coffmans were found in this tax year. 1817 Tax List of Washington County, Kentucky showing Jacob Coffman paid tax on 50 acres. 1818- Is missing from this film. 1819- No Coffmans listed in this tax year through Images 97-104. Figure 1 Note that William, Thomas and Elizabeth Fowler are all listed sequentially. Also note the plus mark in the column for Thomas. 1820- Coffman- There are no Coffmans listed under the “C” portion of the tax roll. Jacob Coffman is residing in White County, Illinois in the 1820 census in that portion of the county which becomes Hamilton County. 1820 – Fowler- Image 191 Elizabeth Fowler 153 acres on waters of Cartright entered by Walton and 5 horses; Image 192 William Fowler 50 acres on the waters of Chaplin and no horses; Thomas Fowler 97 ½ acres on Roling Fork and 3 horses. It is notable that the Thomas Fowler that has been associated with William Fowler on Chaplin Creek is no longer listed. This may indicate that Thomas Fowler died before 1820 but it might also indicate that he may have left the county. Perhaps he left with Jacob Coffman and his daughter, Arey and others of the Coffman, Fowler, Hungate and Ward settlement cluster that was in the part of White County in 1820 which became Hamilton County in 1821. There are no deeds in the name of Jacob Coffman so the source of the 50 acres on Chaplin River is unknown. It is interesting to note that William and Thomas Fowler are also associated with a 50 acre parcel. There is a deed for the Fowler parcel described in Note 2 below. Washington County, Deed Book C, Page 419; Film # 007901325; Image 218 of 1087; Grantor: John Grundy and Jane, his wife of Washington County, KY; Grantee: Thomas Fowler of Green County, KY; Description includes west side of Arbuckles Creek; The number of acres was apparently unreadable by the transcriber. This appears to be the same land on Rolling Fork with original entry by Thomas Arbuckle. Washington County Deed Book G, Page 369; Film #007901326, Image 192 of 1241; Date: 10 Dec 1821; Grantor: William Myers et al. heirs of John Grundy; Description: 27 acres lying on the south side of Rolling fork and beginning at the mouth of Arbuckles Creek. Rolling Fork and Arbuckles Creek are located south of Lebanon, the county seat of Marion County which was created in 1834. There are no deeds through 1860 that name Thomas Fowler as a grantor. This man appears to be the Thomas Fowler that died in Marion County in 1849. He directed in his will that Catholic masses be said for him and he is buried in a Catholic Church yard so I do not believe that he is related to Thomas Fowler, the father-in-law of Jacob Coffman. Washington County, Deeds Book F, Page 98; Grantor: Matthew Walton and Frances, his wife; Grantee: William Fowler all named of Washington County, KY; Description: 50 acres on waters of Chaplins. William Fowler was the grantor to Charles R. Kinchelow in Deed Book L, Page 466. Deed Book L covers the period of 1831-1833. Deed Book L is currently only available on microfilm. By [signature] Jessie Gregory D.C.
7 March 1806, Thomas West of Fairfax etc. (see previous deed) sold to Nathan Ward of the County of Washington and State of Kentucky for "one Dollar in hand paid" 100 acres in Washington County on Chaplins fork being part of Thomas West's 500 acre survey, beginning at James Ward's northeast corner, also mentions "south west corner to James Ward". Witnesses: Archibald Dorethy, Wiley Malloney and Hamilton Freeman. 7 March 1806, Thomas West, attorney for Thomas West Sr. etc (see book C page 238) sold to Samuel Ward of the County of Washington and State of Kentucky, 150 acres "being part of a tract of land patented in the name of Henry Banks & from him deeded to Thomas West Sen". Mentions William Merideth twice in the land description. Witnesses: Wiley Malloney, Nathan Ward and James Ward. Note: This deed has been copied (typed), and it appears part of it is missing. The phrase "consideration of the sum of in hand paid" is missing the "sum", and it also does not mention where the land is located. Since William Merideth lived in Washington County, and the deed was recorded in Washington County, it's a good bet that is where this land was located. In my review of the tax records for Washington County, I have focused on the surnames COFFMAN and FOWLER. I found no record that Isaac Coffman ever paid taxes on his parcel of land. In 1987, Mary Jo Maguire published a grantee and grantor index for Washington County, Kentucky from 1792-1860. There is no record of Isaac Coffman as a grantor. The only Coffman deed in her “Co” index was this solitary deed that has been transcribed herein. I have photocopies of the “Co” section of Maguire’s Index but I should also get copies of the “Ca” and “K” sections just to be sure that Coffman deeds were not under a variant spelling. Search the Fowler deeds as I did find that William Fowler also paid tax for 50 acres on Chaplin Creek. Another task is to attempt to sort out the records of the Coffmans in Mercer County, Kentucky. I have also been searching for web resources related to the search terms: "Coffman killed by indians". This will have be the subject of an upcoming blog post.